Porgy and Bess is as much of a serious, classical work as it is a political work. 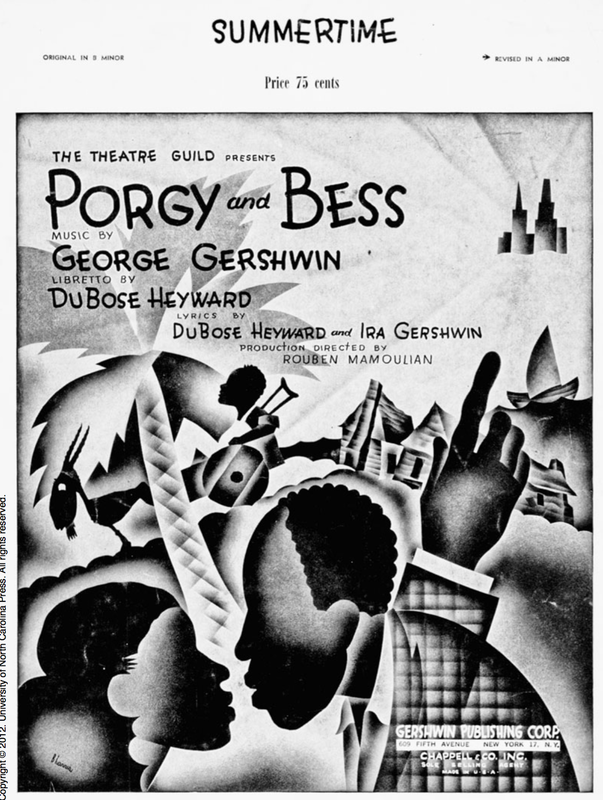 Porgy and Bess was created in collaboration with composer George Gershwin, and lyricists Ira Gershwin and DuBose Heyward. This cultural opera has been a prime example of the struggle of black and white relations and racial equality in art and performance. 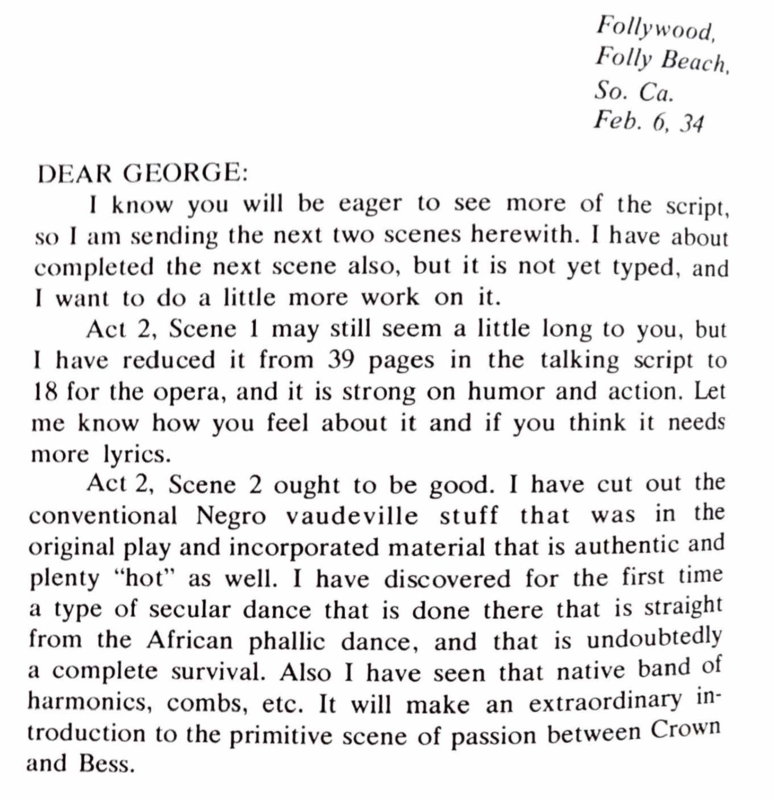 In his letter to Gershwin regarding Act II, Heyward writes to Gershwin explaining his ideas regarding a dance in the scene and the overall authenticity of it. Why is Porgy and Bess a popular topic when it comes to talking about the racial history of America? Firstly, it was composed, written, produced, directed, and critiqued by white people; yet it is about the behavior, beliefs and expressions of black people. This does not have to be problematic. However, as soon as people start making claims to authenticity, then it is problematic because people outside of a culture are adapting another culture without having experienced it or having fully understood it. 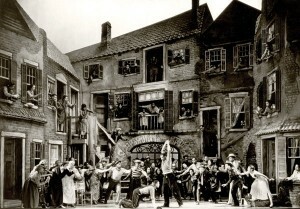 Many of the reviews that circulated when Porgy and Bess premiered praised the authentic of portrayals of black culture. The opera itself does not represent black culture and does not inform us of what was authentic (because that is always a moving target), but it informs us about the white perceptions of authentic black culture. Because most reviews addressed authenticity, this is a prime example of the fantasy that the journey to racial equality was “easy” and quick. 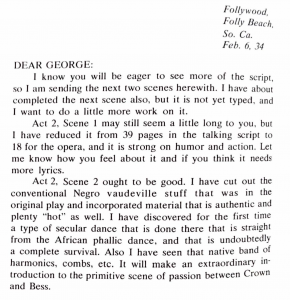 In DuBose’s letter to Gershwin, it is interesting that he used language like “primitive” yet the work was a prestigious and accepted genre: the opera. This seeming juxtaposition highlights the idea that people were willing to ignore the fact that this opera says more about white perceptions than authenticity of black culture. This omission mollified guilt and does not challenge any fantasized perceptions, making it the idealized path to racial equality. Many of these critiques of Gershwin’s opera are also relevant today. It is important when performing works from other cultures to be conscious and well informed of personal perceptions and what is authentic. Ewen, David. “A Giant Stride Towards Greatness.” George Gershwin His Journey Towards Greatness, Prentice-Hall Inc., 1970, pp. 220–222. Noonan, Ellen. The Strange Career of Porgy and Bess: Race, Culture, and America’s Most Famous Opera. Chapel Hill: University of North Carolina Press, 2012. Accessed November 5, 2017. ProQuest Ebook Central. Richard Crawford. “Porgy and Bess.” The New Grove Dictionary of Opera. Grove Music Online. Oxford Music Online. Oxford University Press accessed November 5, 2017, http://www.oxfordmusiconline.com/subscriber/article/grove/music/O004106. This statement seems to be thrown out lightly, in order to draw in audiences to the concert. While not inherently wrong, this simple statement fails to capture the turmoil of American identity represented by Porgy and Bess. The Manitou Messenger is far from alone in ascribing blanket claims to music. As seen in the history of blues, jazz, and folk music, we have yet (if ever) to define categorical sounds for each of those topics. Gershwin has entered the vernacular as a truly American composer, but historical context is necessary to frame this claim. Ellen Noonan presents a holistic take on the history of performances of Porgy and Bess, and the politics involved with them. Because the Manitou Messenger article was written in the 1950, I will look at Noonan’s commentary on the state of Porgy and Bess in the 1950s. Noonan takes a strong stance on the political motives of Porgy and Bess. Musical elements aside, Porgy and Bess became a driving force in pushing what it meant to be American. As such, the music became accepted into the realm and began to define American music. Noonan goes on to argue that Porgy and Bess mirrors the struggles of black people in the growing era of the Civil Rights movements. The U.S. government’s “propaganda efforts (like the Porgy and Bess tour) intended to convince the world that incidents of racial discrimination and violence were exceptional rather than typical” (189). If this is true, then perhaps Porgy and Bess does represent American music–that which is filled with rich history and suffers from a constant watering down and manipulation to fulfill a national identity. Wether the identity is organic or fabricated, Porgy and Bess has certainly lent itself to an American musical identity, and it is clear that the message of American greatness trickled down into local college newspapers. A greater understanding of the history of any music is necessary in order to more fully inform a claim for an individual to express “the modern American idiom”. Gershwin, Bennett, Shaw, Merrill, Stevens, Bennett, Robert Russell, . . . RCA Victor Orchestra, performer. (1950). Porgy and Bess. Flaten, Anne. “Berglund Directs St. Olaf Band In Winter Concert This Evening”. The Manitou Messenger, No. 15, Vol. 063. February 17, 1950. Noonan, Ellen. The Strange Career of Porgy and Bess : Race, Culture, and America’s Most Famous Opera. Chapel Hill: University of North Carolina Press, 2012. Accessed October 30, 2017. ProQuest Ebook Central.